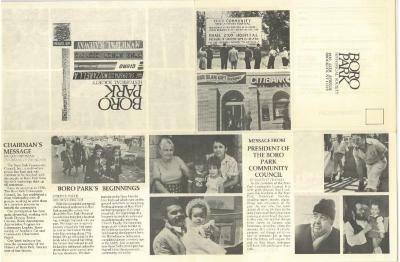 MESSAGE FROM PRESIDENT OF THE BORO PARK COMMUNITY COUNCIL BY SIMON D. FRANKEL As the president of the Boro Park Community Council, it is with great pleasure that I welcome this brochure of the Boro Park Historical Society, recalling many people, places, things and occurences of the past. As one who has spent almost all of my life here in this area, I can recall the Culver Line running at street level, the open trolley cars, the gradual change from farms to homes, and businesses spreading along the avenues. It is a story of people, progress, and change, yet it is so nice to reminise. Let us hope that the future will surpass the past so that future historians will look with pride upon Boro Park.